Hamburg presents many articles in horn, some pretty furniture, a large collection of sticks, embroideries, and Turkey showcases fine silks, raw materials, stuff of the earth, carpets and rugs much remarked upon. A million people under that glass during the course of the Exhibition. They dally and gasp at the exquisite watches from Switzerland, very diminutive, true craft, barely an inch in circumference and wound and ticking audibly, most beautifully set with lovely enameled exteriors. Grain and chocolate and guns, muskets and French pistols (the famous duels) and a stuffed Apache. Crimson fruit from Amazon vines and brown slivers of llama meat, dried and cured. Does anyone have a clue about what the „stuffed Apache” could be? I thought it was one of the French exhibits, but I browsed through the Catalogue of the Exhibition (it is available on-line at https://archive.org/stream/cu31924031227105/cu31924031227105_djvu.txt) and could find nothing. My guess is that it's the stuffed (preserved) body of an Apache (human). 38 Stuffed bear, stuffed birds, and other animals. 47 Case of stuffed birds. 64 Two stuffed dogs, of the pure terrier species. deer ; preserved panthers, male and female. Or maybe it's included in #38. This was New York in 1853 - things were a little different then. God, could that possibly be? At such an exhibition? I wouldn't believe it. What is strange is that there's no mention of anything like that on the net - and one thinks there should be. But it seems I have no other choice than to write exactly that. No Renee we don' t use the term breed when we refer to humans, breed is a term for varieties of animals or plants to use the term breed for people is to dehumanise them. The Apache were a cultural group of related North American tribes . you are within the apache Indian tribe you have insight that dwells deep within your heart. Meaning of Apache is "a violent street ruffian, originally in Paris"
That's true of the original meaning, but in the context it's far more likely to relate to an indigenous American person. I didn't go to the link, because I assumed this is a text from at least the 19thC, if not earlier? In which case, yes, taxidermists did indeed stuff native Americans. They used their skulls as drinking cups too, and imposed on them all manner of strange hideous indignities. Though it is very difficult for us in the 21stC to get our heads around this, they didn't do it necessarily because they were depraved, inhuman people - but because they did really believe that "Savages" were not human. Their idea was that anyone who wasn't white was sub-human. Thousands of people lived and died with that belief; thus didn't even see it as an offence, let alone a crime against humanity. Which is evidenced by the presentation of this article casually thrown in with all the other things. But hey, the world has moved on since then. Yes - it's an OCR-generated facsimile of the catalogue of exhibits - must be quite a tome. I got to the missing page 93, and that is not the end of "Section One - the USA". "GB and Ireland" covers another 40 pages. Turkey, and contributions from the "Emperor of Hiyti" are on page 192. The original is in Cornell University Library. It is intriguing that the presence of a stuffed Native American at the 1853-1854 Exhibition is not mentioned anywhere on the net (not just in the catalogue). Someone would have brought it to attention. I am starting to suspect this is an invention of the author (the quote is taken from Colson Whitehead's The Intuitionist, which mixes truth and fabulation). I don't think it's unlikely at all. It just wouldn't have been newsworthy - like killing off a couple of endangered species in Africa. "Oh well - there are lots more wild animals to hunt!" I haven't found any other mentions of stuffed natives in museums - but there's one in a book called "The Changing Presentation of the American Indian: Museums and Native Cultures" which mentions young native children being abducted and displayed in the Musée de l'Homme for one of the King Louiss. Dear DragOnspeaker, I find this downright macabre, revolting and just... so immeasurably sad. But then, if we look around (and maybe within as well), don't we see the same today? Anyway, I think I was just amazed such an exhibit could be exposed at that particular Exhibition (of the civilized nations' accomplishments), not that it existed as such. It would have been almost like bringing a living chained slave to be shown - as an achievement, right? But then how does a human corpse ultimately differ from an animal one from the point of view of taxidermy? 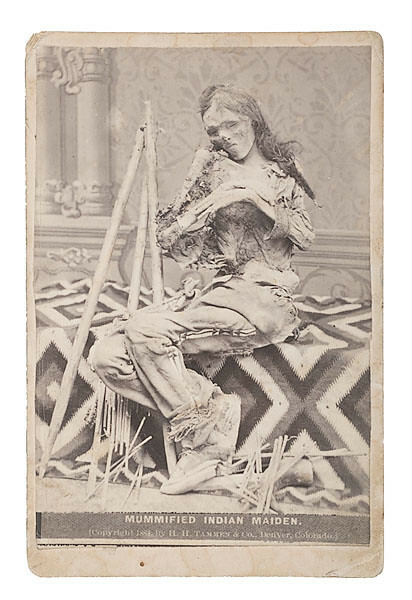 It is the quoted text that insinuates the subhuman (in Romany's words) status of the Apache, but he might have been just a proof of taxidermal mastery - or, alternatively, a curiosity, like various circus or fair monsters. I'm just rambling, sorry. And yes, I understand not mentioning it at the time and the reasons for that, but it is curious to me nobody mentions it even today, in various sources discussing the Exhibition (I somehow expected this to be a big issue what with the whole political and ethnic correctness of our times). Justina - the Internet is a wonderful source, but search engines are not completely comprehensive: it depends on what is made available to it. And a certain amount of censorship, (often fuelled by politics) also takes place. Books, old newspapers, letters, office files, and ancient magazines are still the most comprehensive when undertaking historical studies. A lot of these ARE available on-line, but you have to know HOW to find them. Particular data-bases, University data-bases, newspaper data-bases, etc. etc. are plentiful but need specific navigation...and lots and lots of reading.People who regard "Wiki" as the font of all knowledge rarely take the trouble to do actual research. I'm not in the slightest judging YOU- simply explaining why Google,or other search engines, often can't seem to produce specific results. The things humans have done to other humans are horrendous, and no-one who studies history remains oblivious to this fact. I have had students contact me in tears when studying Colonial History (of all nations)! The "stuffing" of human people is mentioned in books/letters/journals; one of them I remember was in a book discussing the life and reign of Queen Victoria. Not the first source that would occur to most people!! On the other hand, studying history, one becomes aware of how truly wonderful and amazing people, communities, countries can be. And what great and inspiring heights the human race can, and has, achieved. Under the twinkle of a fading star. At five o'clock in the morning. Thanks for reminding us all of Eliot. I know you put it here because of the "we are the stuffed men" - but a little bit of Eliot to read on a bleak Sunday afternoon is a nice little addition. ps - I wonder how many times those last two lines have been quoted? Must be millions! Ah, I think those stuffed men are the other branch of the family from matchstick men, JJ! Perhaps I'm grasping at straws, but could a word have been accidentally deleted from the catalogue? The phrase would then read "stuffed Apache cushion" or "stuffed Apache target," something more in keeping with the array of furnishings noted therein. Sadly I think you are clutching at straws. It would not be the only time such a thing has been done as recently as 1997 there was a 170 year old stuffed African in a museum in Spain, he has been returned home for burial.